Pixe Social, developer of award-wining smart digital marketing solutions, announces its partnership with ReedPOP to provide a fun photo booth-based gaming experience to attendees at upcoming New York Comic Con (NYCC) to be held during 9-12 October 2014. This is the second year in a row that Pixe and ReedPOP are partnering to bring social engagement to NYCC attendees. 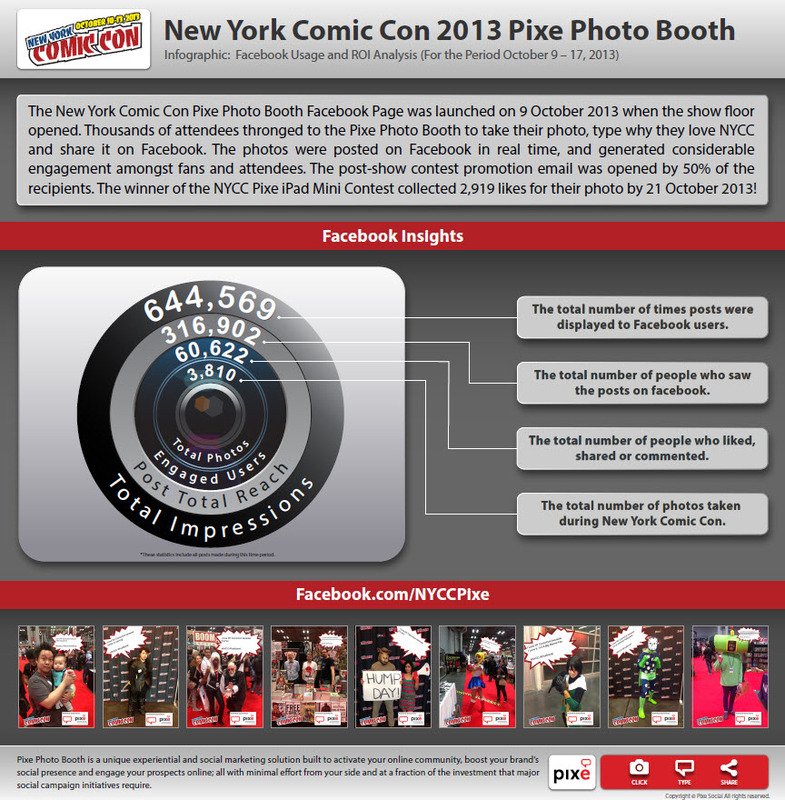 At NYCC 2013, attendees had shown tremendous appreciation for the official photo booth solution, powered by Pixe, generating a remarkable amount of viral activity and reach for the brand online. The 3,810 photos shared live from the NYCC 2013 Pixe Photo Booth were viewed by 316,902 people a total of 644,569 times on Facebook between the period of October 9-17, 2013. At the upcoming 2014 event, Pixe’s technology will once again be used by the event organizers to share attendee photos in real-time from the show floor on leading social media including Facebook and Twitter, enabling fans to tag, like, and share their photos with friends and family online. In addition, fans of the event can also download the Pixe Snap mobile app to share their own NYCC branded selfies with their Facebook, Twitter, and Instagram followers. The NYCC Pixe photo booths will be available in six stationary locations at the Javits Center, in addition to which numerous NYCC representatives will roam through the Artist Alley and North Pavilion with mobile devices to enable attendees to easily snap and share photos.